Home LifestyleMiscelleneous	I wonder how many lies start like this…. Sure I could say, yeah I took Oscar and Krusty for a walk at the lake. It was a beautiful day, and leave it at that. I mean it IS true. But what am I really saying? Look at me and how together I am! We went to the lake for a walk, in the beautiful sunshine! I listened to my ipod, Krusty got in the water, Oscar looked at the leaves! All true. But what I left out is the much better story. The real story. You see, it took about an entire hour to get everything pulled together to leave the house in the first place. Oscar needed to nurse and have a diaper change. He needed a new outfit because he spit up all over the first one. I needed to get dressed and into my running shoes (a feat in itself these days – anything with laces take 3 times as long). I had to get Krusty’s leash and poop-bags together and into the stroller. The stroller was in the house which meant it had to be taken outside, folded up and put into the car. I wanted to load up my ipod with some new music I had just downloaded. However, itunes refused to see the ipod on my computer and I fought with it for Oscar’s entire nap only to end up with 4 songs added twice and a 5th song once. Not nearly the entire playlist.I powered on however, determined to enjoy the day and the weather and get the boys outdoors and some much needed exercise. It will be fine once we get there. Just get there. When we FINALLY left the house I realized that I was beyond out of gas and needed to stop at the first possible gas station. I also forgot to bring water for all of us so I would pick that up as well. Drove up to the pump and didn’t realize it had one of those ‘out of order’ bags draped over it and due to the weirdness of this particular gas station, I had to drive all the way around the pumps to get to a working one. Got the gas and drove to the window for my water (drive through convenience store, yay!). The cashier dropped my card as she was handing it back to me and of course it went all the way under the car. Ok, reverse, park, get out, retrieve card, back in and on our way. And she gave us 2 dog treats! Score! Things are looking up. We get to the park and take approximately 18 minutes to get everyone unloaded and reloaded (or leashed) and finally FINALLY, headphones on (well in one ear anyway) we are off! Except that we take 4 steps and Krusty has to stop and pee. No problem, we just got out of the car. Two more steps, stop-pee. We repeat this every 2 steps for the next 500 on the way to the path. It takes approximately 3 hours and 12 minutes. And Krusty has lost about 12lbs of fluid. We FINALLY get to the bridge where thank God there is nothing green to sniff/pee on and start walking over the lake. About halfway over the bridge I realized that Krust has realllly slowed down. I look back and he is crouched down SO low that I was convinced he had a cramp and/or one of his legs fell off. As it turned out, he was terrified of the bridge! He kept looking over the edge as if he just knew it was all over for him. He even backed out of his leash somehow for a moment and just stood frozen. It was mostly sad, but a little cute I must say. Once we made it to the other side our “walk” resumed the aforementioned pattern of take 2 steps, pee, 2 steps, pee, repeat. Only now that there are woods on either side, Krusty invoked a lovely zig-zag that either 1) got him tangled up with the stroller or 2) pulled us all off the path. #2 happened more than #1 and as I would try to pull him back I would stray too far from the ipod, causing the earplug to come FLYING out of my ear OR come unattached from the ipod itself. Add in a mix of other walkers, joggers and dogs and you have yourself a recipe for disaster. Please allow yourself to imagine me with a stroller, leash and ipod all going in different directions as I try to get some “exercise”. It was as ridiculous as it sounds. And then we took what I thought was the shorter loop and it turned out to be a dead end! OH the anger. I am pretty sure I burned more calories being annoyed than I actually did walking. So instead of a brisk walk around the lake, we made it about 1/4 of the way, got lost and had to backtrack .Of course that meant going BACK over the bridge of death, which only added 13 years to our time. Once we made it back to safety, we took a break on the deck and I gave Oscar some lunch. 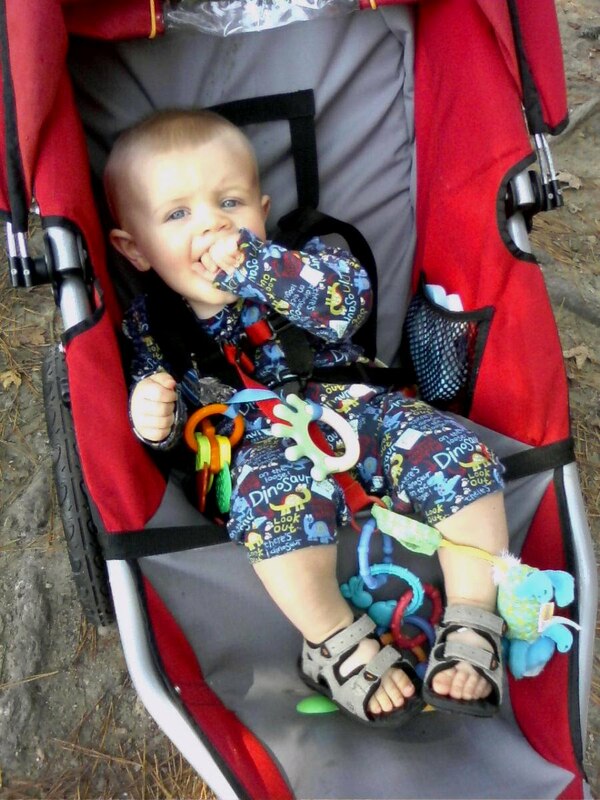 He was fussing the whole way back from the walk clearly as over it as I was. 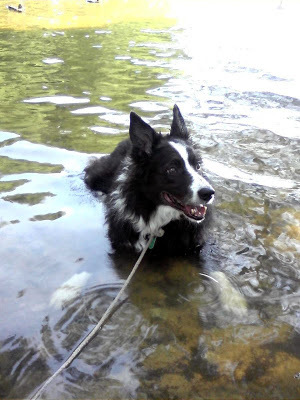 After Oscar finished eating and Krust refused to drink from any of the 17 bowls of water the park kindly offered, we walked over to a low spot on the shore and I let Krusty just lay in the water. He was in heaven. By this point, Oscar was in good spirits too and we all enjoyed a peaceful 4 minutes by the water. That is until some little girl wouldn’t stop circling us. I have little patience for this sort of thing under normal circumstances, much less when my hopes and dreams of adorable exercise have just crumbled before my eyes, so we left. All told I think that despite my frustration, Krusty and Oscar had a pretty awesome time and I am glad for that. However, next time I’ll just wear flip flops and call it what it is – taking the kids to the park. frank HATES bridges and especially hates water. he is really a dog, i assure you. If ONLY it were as easy as "yeah I went for a walk to the lake"!! That would be amazing. I can't ever get out the door with my son and my dog just to go around my neighborhood without a small catastrophe happening. I wanted to let you know that over on my blog, in this post I have given you an award. I hope you'll accept. I'm really enjoying your blog and wanted to acknowledge it!